Thankfully, poor mental health is being recognised more and more across the Nation as a prevalent issue that millions suffer with. It’s estimated that around 1 in 6 people have experienced a mental health problem in the past week; that’s in the UK alone. Although it’s not something that can be fixed overnight, there are some key activities out there that have been proven to aid positive mental health, and sport is one of them. 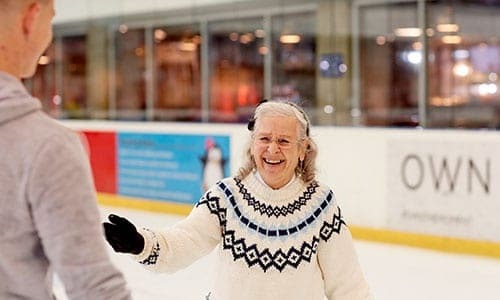 There are tons of amazing ways ice skating can help tip the mental health scale back over to the positive side; here’s our top 3! Hopping on the ice is a great stress reliever. There’s two ways to look at this. If you’re a complete beginner then you’ll be entirely focused on staying on your feet, that means no time for worrying about that fast-approaching deadline. For those who can skate effortlessly (lucky! ), you can calm the mind by enjoying your immediate surroundings and use it as a form of meditation. Okay, hear us out on this. We’re definitely not saying that getting a soggy bum makes you feel like a 10/10, however each time you step on the rink you improve. You go from awkwardly shuffling whilst looking at your feet, to skating laps chatting to your mates! There’s no denying that mastering a new skill, or even just being good at something, makes you proud to be you. Exercise has been proven to have beneficial influences on depression, anxiety and ADHD just to name a few, so take to the ice and see what skating can do for you!